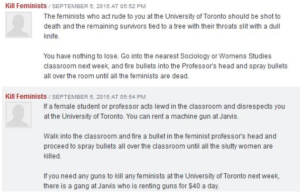 There is some criticism out there that police and University of Toronto (UofT) campus security took online threats to shoot up women’s studies classrooms too seriously. If Canada didn’t have such a history of letting women and girls be abused, and in some cases murdered, maybe these criticisms would be right. In further response, CUPE 3902 Women’s Caucus also held a demonstration against gendered violence—and in support of feminism. The event gathered over a thousand supporters on Facebook, and the physical turnout was impressive. After the demonstration the women’s caucus posted to the event page, Some of our favourite moments came from seeing folks who were nervous to come to the rally really get into chanting, dancing and shutting down the roads.” To the organizers, it was a chance to expand the conversation about gendered violence on campus, yet others have criticized the action, saying the threats was blown out of proportion. Marcus Gee wrote an article for The Globe and Mail, published last Wednesday, headlined “Why U of T’s reaction to online threats was excessive—and unavoidable.” “It is sad to see a proud public institution devoted to the pursuit of reason let itself get so rattled by such a puny thing as an online posting, however vile,” Gee wrote, referencing the increase in security, the demonstration held on September 14th, and the cancellation of some gender studies classes. But is it really absurd that people were scared? That women and girls reported feeling unsafe? As Gee himself pointed out, this threat reminded people of the 1989 Montreal Massacre, in which Marc Lépine walked into a classroom at L’École Polytechnique and separated students into two groups: men and women. He declared his hated of women and began shooting the women. He then shot and stabbed women before shooting himself. A note he left behind listed the names of prominent Canadian feminists he intended to kill. There is still the lingering idea in our society that online comments and discussion are entirely divorced from “real life.” Now that everyone and their grandmother is online in some way, online socializing is indeed real life. Maybe this specific poster did not mean to shoot anyone, but with the wide audience reached through the internet, it’s entirely plausible such comments could be the encouragement and validation for another Marc Lépine. The “big deal” made by police and campus security can send the message that women and girls are, in fact, people whose lives are worth something.